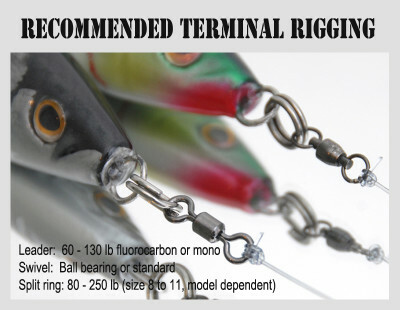 Click the button below to add the Strategic Angler Espada - Sinking to your wish list. The Pacific Saury belongs to the family Scomberesocidae. They comprise of highly migratory pelagic schooling fish whose range include the North Pacific, Japan to the Gulf of Alaska, and south to Mexico. They are generally found offshore near the surface, gliding out of the water as predators attack, just like their flying fish cousins. A popular forage species for Tuna and Billfish, their iridescent sides, knife-like profile and sharp cutting action make them an attractive and rewarding meal. The name Espada (or Yaiba) aptly describes the slicing action of this lure. 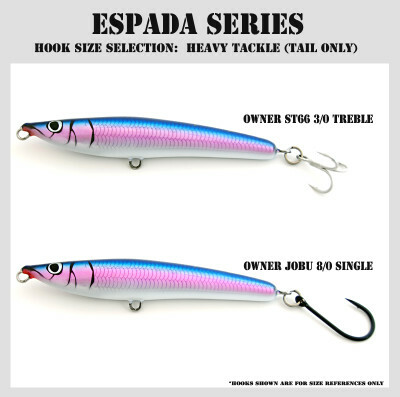 The Espada series measures 9.25 inches and represents an adult Pacific saury, Ballyhoo, Flying fish, a juvenile Mackerel or Herring and makes it a good all around multi-species casting lure. The Espada features a smooth, streamlined body with a 2.4mm wiring system (same as the Kratos series), capable of handling any fish of your dreams. The Espada series sits near vertical at rest with its tail down (both floating and sinking versions). Various techniques will make this lure come alive. What are you waiting for? Wield your weapon and prepare for battle! The Espada-F (floating) sits tail down on the water’s surface at rest. To create a surface side to side glide, slowly pump the rod tip down rhythmically; it may take a few tries to get the action right and may depend on wind and current conditions. Don’t forget to pause in between, as most strikes occur at this time; the head will also pop out during the pause. To achieve a longer surface glide, switch to a lighter belly hook or just use a tail hook. Slowly sweeping the rod tip left to right (or down) will make the lure dive followed by a bubble trail. This audible commotion entices strikes at anytime, so always keep your eye on the lure as it pops out of the water. The Espada-S (sinking) descends about a foot a second just like a dead bait fish. A faster sink can be achieved by using heavier or larger tail hooks. 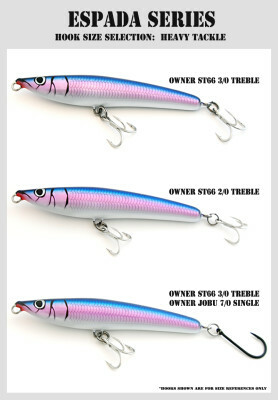 Jigging the lure will make it come alive underwater with an erratic darting action; pausing it will make the lure sink tail first. Rhythmic jigging of the lure will make it dart left and right, giving it an underwater walk-the-dog presentation. A subsurface rolling action can be achieved by casting the lure out and letting it sink to the desired depth. Quickly sweep the rod left to right (or up) to make the lure dart and roll underwater, creating a side flash like a fleeing baitfish. If you are looking for the split rings, you can find them here. We recommend #9 split rings.